Just before they locked the doors on 7500 Security Boulevard and went home for the April Fool's Day weekend, CMS staffers quietly released six lines of text on the web page where they post updates about the Pre-Claim Review demonstration project. As of April 1, 2017, the Pre-Claim Review demonstration will be paused for at least 30 days in Illinois. The demonstration will not expand to Florida on April 1, 2017. After March 31, 2017, and continuing throughout the pause, the Medicare Administrative Contractors will not accept any Pre-Claim Review requests. During the pause, home health claims can be submitted for payment and will be paid under normal claim processing rules. CMS will notify providers at least 30 days in advance via an update to this website of further developments related to the demonstration. Curious, we contacted the CMS press office to get more detail. They were able to add one more line. "CMS is considering a number of structural improvements in response to feedback received on the demonstration to date." Still certain there must be more to the story than the CMS press rep was allowed to say, we turned to those most impacted by the delay, providers and their trade associations in Illinois and Florida. Before CMS announced the Pre-Claim suspension to the world, the Illinois Home Care & Hospice Council had an idea that it was coming. 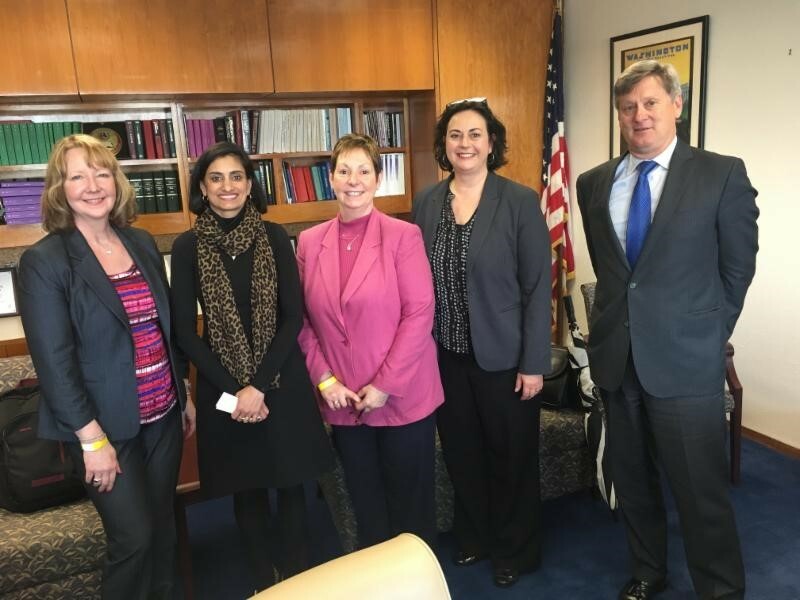 They had been invited to meet with Administrator Seema Verma in March and sent Executive Director Sara Ratcliffe and some board members to the Washington HHS office, where they were joined by NAHC's Bill Dombi and some Florida providers. Susan Platt, administrator and co-owner of Spoon River Home Care in Peoria, told us, "For the first time in eight years, Home Care has a seat at the table! This is a very exciting and hopeful time for us," she said. "They are finally asking for our input." Ms. Verma said she wanted to meet with providers in person in order to get insider views of the PCR experience by those who have been living with it for eight months. That meeting ended with the CMS administrator's request that they come back to her with a list of suggestions for improving the PCR system before expanding it to other states and resuming it in Illinois. One of those suggestions came before the meeting was over. When Administrator Verma started the meeting with the assurance, "Our goal is not to make your life harder," she was met with the clear response that PCR, under its current requirements, "does, in fact, make our lives harder, much harder." Making PCR voluntary, but with the expectation of additional MAC/ZPIC/RAC scrutiny for providers that do not participate. Allowing providers to "graduate" from PCR when their approval rate exceeds some threshold in the high 90 percent range. Excluding hospital referrals from the requirement. Limiting the requirement to initial episodes, eliminating successive consecutive episodes. Limiting the requirement to certain diagnosis codes. Asked about the fear that some providers would be swamped by the PCR paperwork burden and close their doors rather than bear the expense, Ms. Ratcliffe said she has not seen that happening in Illinois. "Maybe one or two agencies that were already on the edge called it quits but not because of PCR alone," she said. "In fact, we are hearing that many agencies like it. They like getting specific feedback about their documentation errors and they like knowing pre-approved claims will be paid without question." We also spoke with Bobby Lolly, Executive Director of the Home Care Association of Florida, who was in the group that met with new CMS Administrator Seema Verma last month. "We were in DC for our advocacy meetings," he told us. "We met with our two Senators, Nelson and Rubio. Then we sat down with Ms. Verma. She was very interested in hearing our thoughts about PCR." Not only was she interested in the thoughts of association representatives, he continued, but "The day after we got home from DC, she called us and said she wanted us to pick three providers to fly to DC to meet with her in person. They did, and she actually listened to them." During that meeting, the same one the Illinois delegation attended, the CMS administrator expressed her surprising opinion that Pre-Claim Review was never intended to be a fraud, waste, and abuse prevention activity. She said the primary purpose was to be assured that Medicare beneficiaries receiving home health services were genuinely eligible for the benefit and the services for which providers were billing. The only way to know that is if agency documentation clearly shows it. In response, both association executive directors told the same story: "The criminals that have infiltrated Medicare Home Health do not see patients, they just manufacture claims. If they have to submit PCR documents to prove their 'patients' are homebound and that there is medical necessity for a nurse to provide services, they will have no trouble forging those documents just as easily." After listening to provider concerns at the in-person March meeting, Ms. Verma assured them she would be making a decision about continuing or delaying the demonstration and would let them know. She did. "On Friday, March 31, at about 4:20 pm, Eastern Time, we got the notice that PCR would not be starting in Florida the next day," Lolly reported to us. After PCR resumes in Illinois and starts in Florida, CMS is likely to keep with its original plan to expand the demonstration to Texas, Michigan and Massachusetts before going nationwide. Everything still hinges on efforts in Congress to change the Affordable Care Act, of course, but it remains possible that every provider will be submitting pre-claim documents by 2018 or 2019. One additional change on Ms. Verma's mind would make that roll-out easier on the rest than it has been on Illinois. Bobby Lolly told us how that might work. "She said she was concerned about all the trained and, by then, experienced reviewers at Palmetto that would eventually be idled when Illinois and Florida providers bring their approval rate above the 90+ percentile and no longer have to participate. Her idea is to manage the roll-out in such a way that one state would start as a previous state began its expected decline in the number of pre-claim submissions. That would even out the workload and allow each MAC to keep its staffing needs more predictable. That alone is enough reason for CMS to make the modification that would let providers 'earn' their way off the program." Both state association directors promised to let us know what suggestions they submit to CMS, as well as anything they might hear from Ms. Verma in advance of the next public announcement. We will pass along everything we learn. Regarding restarting the demonstration, both directors are guessing the promised 30-day in advance alert will come toward the end of April. Q: Why is CMS pausing the PCR demonstration? A: CMS is pausing the PCR demonstration while we consider a number of changes to improve the PCR demonstration. Q: What kind of changes are CMS considering? A: CMS is considering a number of structural improvements in response to feedback received on the demonstration to date. Q: For how long will the PCR demonstration be paused? A: The pause will be for at least 30 days. Via an update to its website, CMS will notify providers at least 30 days in advance of further developments related to the demonstration. Q: What happens to the PCR requests I have already submitted to the MAC but for which I have not yet received a decision? A: Effective April 1, 2017, MACs will cease reviewing PCR requests and will process home health claims under normal claim processing rules, as in effect outside the PCR demonstration. Q: What happens if I have submitted a PCR request, it was reviewed and non-affirmed by the MAC, and I was preparing a resubmission package? Can I still submit it? A: Effective April 1, 2017, MACs will cease reviewing PCR requests, including resubmissions of PCR requests. MACs will process home health claims under normal claim processing rules, without regard to whether a PCR decision was made and/or a Unique Tracking Number (UTN) is included on the claim. Q: I received an affirmative decision on my PCR request and received a UTN. When I submit the claim, should I include the UTN on the claim? A: Providers that received UTNs (indicating that a PCR decision was rendered) are encouraged to include such UTNs on home health claims they submit, even those claims submitted after April 1, 2017. Claims submitted with a UTN will continue to be excluded from Recovery Audit Contractor (RAC) and Supplemental Medical Review Contractor postpayment reviews and most MAC prepayment and postpayment reviews. Q: During the pause, will claims in Illinois and Florida be automatically paid by the MAC? A: Effective April 1, 2017, MACs will process home health claims under normal claim processing rules, without regard to whether the claim underwent PCR. The system will treat claims as it did before August 3, 2016 when the PCR demonstration began. Q: Can I submit a PCR request if it is for a date of service before April 1, 2017? A: Effective April 1, 2017, MACs will not accept any PCR requests, regardless of the date of service listed on the PCR request. PCR requests should not be submitted during the pause and will not be reviewed by the MAC. Q: How will the delay impact the anticipated start of the PCR demonstration in other states? A: The start dates for Texas, Michigan, and Massachusetts have not been announced. CMS will provide at least 30 days’ notice on its website prior to beginning in any state. Q: Will claims with dates of service before April 1, 2017 that don’t contain a UTN be subject to prepayment review and payment reduction? A: No. Continuing throughout the pause, MACs will process these claims according to the normal claim processing rules, without regard to whether the claim includes a UTN. Claims without a UTN will not be automatically subject to prepayment review or a 25% payment reduction. Q: I have a case with a March date of service, but I haven’t submitted a PCR request yet. Should I hold the claim until after the pause is over so I can submit a PCR at that time? A: Providers are not encouraged to hold claims. Claims submitted after April 1, 2017, will be processed according to the normal claim processing rules, without regard to whether the claim underwent PCR or includes a UTN. Q: Will the demonstration expand to Florida? A: CMS does not have a timetable for further developments related to the demonstration and is exploring options to improve the program. CMS will provide at least 30 days’ notice on its website prior to expanding the demonstration to FL or any other state.